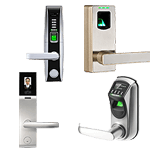 Electronic access control uses computers to solve the limitations of mechanical locks and keys. 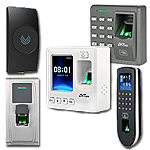 A wide range of credentials can be used to replace mechanical keys like Biometric Door locks, Turnstile Gates etc. 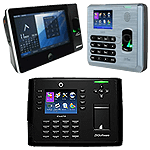 The electronic access control system grants access based on the credential presented. When access is granted, the door is unlocked for a predetermined time and the transaction is recorded. When access is refused, the door remains locked. The system will also monitor the door and alarm if the door is forced open or held open too long after being unlocked. Fingerprint Devices are by far the most popular form of biometric security used, with a variety of systems on the market intended for general and mass market usage. A fingerprint is made up of a pattern of ridges and furrows as well as characteristics that occur at Minutiae points (ridge bifurcation or a ridge ending). Fingerprint scanning essentially provides an identification of a person based on the acquisition and recognition of those unique patterns and ridges in a fingerprint. Face recognition is becoming popular with companies suffering from loss of information and decrease in productivity due to inappropriate security measures. At the same time, big organizations, airports and other high-alert areas are also developing fondness towards the technology. Entrance gates with Turnstiles provide high level of security with bi-directional access control and blend beautifully with high-level corporate environments. All our turnstiles gates integrate with our access control software / time attendance software to increase security and provide an organized entry/exit process with accurate time details thus reducing the staff required to monitor employee access. Turnstiles are highly reliable method to secure access in any industry whether i.e. corporate or any other secure sector. These turnstiles gates use the latest technology to detect tailgating and unauthorized entry attempts. 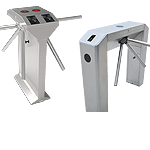 Various types of Turnstile Gates are available viz., Tripod turnstile, Half Height Turnstile and Full height Turnstile gates. 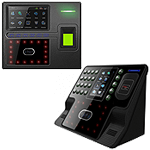 These can be installed in dual lane or single lane options and can integrated with biometric devices like face readers or fingerprint readers or RFID readers. High speed proximity smart card system with unique security codes to provide show card based access to users. 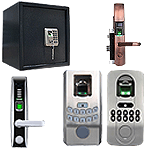 HS proximity based RFID based Access Control Systems provide low price with good performance, designed especially for time attendance and access control for high security zone, server room, Datacenter etc.